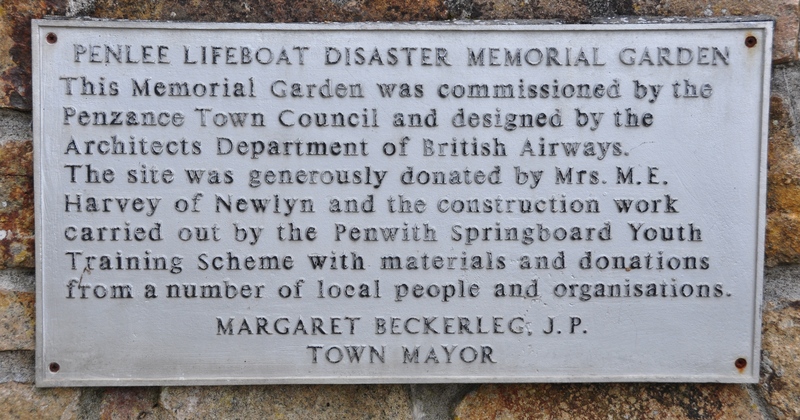 Following the Disaster the Penlee RNLI Branch and Penzance Town Council agreed that a memorial garden would be suitable for people to pay respects and visit. The location was looked at and a piece of land next to the Penlee boathouse and slipway was chosen. The piece of land was owned by a local family and generously donated to the Branch by Mrs.M.E.Harvey. The design of the garden was commissioned to the Architects Dept of British Airways and construction work carried out by Penwith Springboard Youth Training Scheme. Materials for the Garden and donation towards its cost came from donations from several local businesses, individuals and organisations.